Finished Size 36 1/4 (40, 43 3/4, 48 1/2, 51)” bust circumference. Pullover shown measures 36 1/4”, modeled with 4 1/4” of positive ease. Yarn Mirasol Sulka (60% merino, 20% alpaca, 20% silk; 55 yd50 m/1 3/4 oz 50 g): #248 taupe, 12 (13, 15, 16, 17) skeins. Yarn distributed by Knitting Fever. Needles Size 10 1/2 (6.5 mm): 24” and 32” circulars (cir) and set of double-pointed (dpn). Size 10 (6 mm): 24” cir and set of dpn. Adjust needle size if necessary to obtain the correct gauge. Gauge 13 sts and 17 rnds = 4” in St st on larger needle. 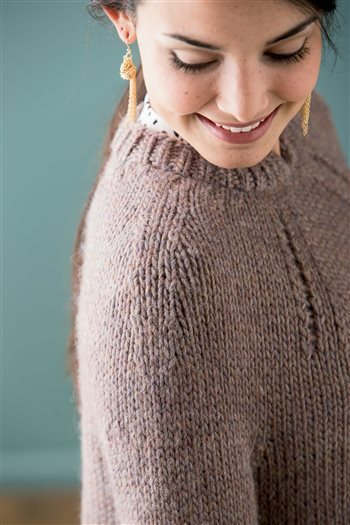 Unusual yoke decreases serve as the main focal point on an otherwise simple shape, while side hem notches are echoed at the neckline.